Nothing scheduled at the moment. • Location of Gibby’s Field. 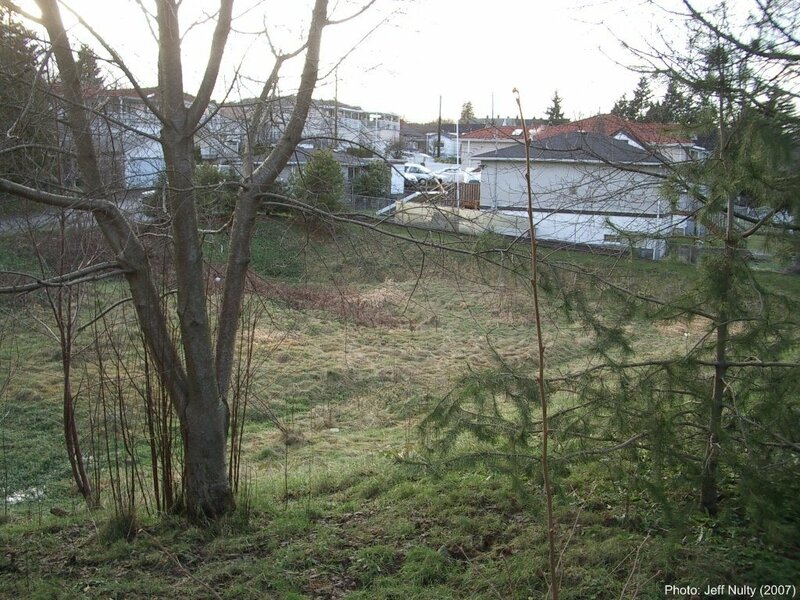 Gibby’s Field lies in a dip on the 1400 block of East 18th Avenue in the neighbourhood of Cedar Cottage in Vancouver. Gibby’s Field is just down the hill from Tyee Elementary School, in a residential area. It’s on three city lots on East 18th: 1454, 1458, and 1462. The streets to the east and west of Gibby’s Field are Dumfries Street and Knight Street. See maps of Gibby’s Field, Cedar Cottage, and Vancouver on the Location web page. • Gibby’s Field is owned by the City and has never been developed. Remarkably, the City of Vancouver owns Gibby's Field in the form of three city lots. Even more remarkably, these city lots have never been developed! 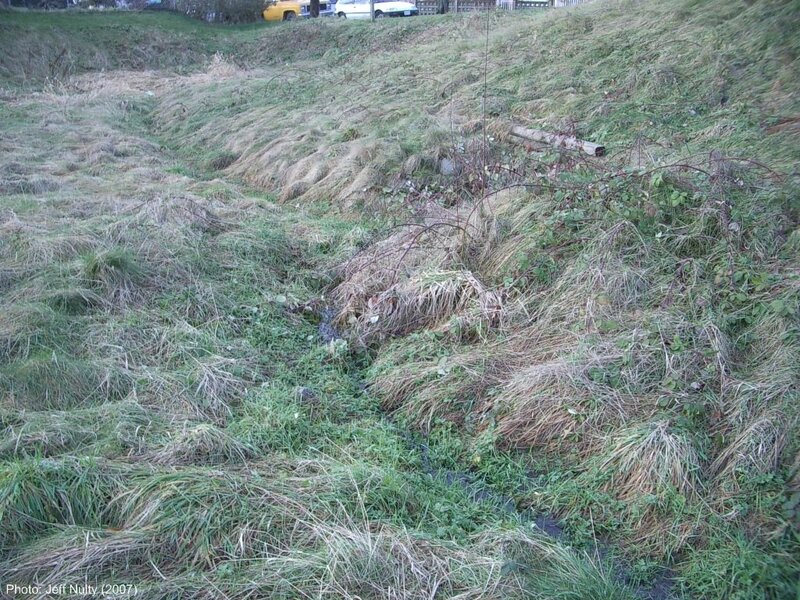 If you go by the lots, you will see that they look like a pasture and contain a stream bed that follows the same path as an old creek, Gibson Creek. See the Gibby’s Field photographs below and other photographs of Gibby’s Field. A higher resolution version of this photograph with annotation and without annotation. November 2009: History booklet (in PDF) “Historical Walking Tour of Gibson Creek Through Kensington–Cedar Cottage.” 32 pages (1.25 MB download). 3 January 2010: History article (in HTML or PDF) “Gibby’s Field, Moses Gibson, and Gibson Creek, Revised.” Two pages. 13 April 2010: “Map of schools, colleges, and the China Creek watershed” (in PDF). Three pages (1.31 MB download). The 2009 history booklet contains a self-guided tour of Gibson Creek and China Creek past King Edward Village, Gibby’s Field, and Vancouver Community College, to where China Creek used to empty into False Creek. Before reading the booklet, it is a good idea to first read a brochure from the False Creek Watershed Society called “False Creek’s Watershed: Then & Now” (available as a PDF here). The brochure helps put the booklet in context — in effect, the booklet is a study of the eastern end of the map in the brochure. In August 2011, Gibby’s Field was announced as one of 125 Vancouver sites to receive a historical plaque as part of the Vancouver Heritage Foundation’s “Places That Matter” project. This project evolved from the City of Vancouver's 125th Anniversary celebrations in 2011. Three events took place Friday 3 May 2013 to mark the installation of the plaque at Gibby’s Field. The main event was the dedication. Those in attendance included seniors Olive Cairns and Florence Anderson who are both in their 90s and remember Gibson Creek, which ran through Gibby’s Field as late as 1944, and descendants of one-time local landowner Moses Gibson, who gave his name to Gibby’s Field. Those in attendance also included Vancouver–Kingsway MP Don Davies, City of Vancouver Councillor Andrea Reimer, and and Mrs. Lublow’s grade 4/5/6 class from nearby Tyee Elementary School. A permanent link to the events of 3 May 2013 can be found at www.vcn.bc.ca/gibbys/plaque.htm. “Gibby’s Field” takes its name from its former owner, who was called “Old Man Gibby” by the neighbourhood children. Old Man Gibby’s real name was Moses Gibson. He was born in 1850 and lived in Cedar Cottage from 1893 until his death in 1937 at the age of 87. The lots are known to this day as “Gibby’s Field” by local people. Moses Gibson used to be a major property owner in Cedar Cottage. He was also a prominent local citizen. He was an early trustee of the first school in the Kensington–Cedar Cottage area which began in 1892, D.L. 301 School. He was a city councillor in 1893, for South Vancouver. And he ran a dairy farm for many years, helped especially by one of his ten children. His farm house and home was on East 20th Avenue, just east of Knight. East 20th Avenue used to be known as Gibson Road until 1910. Gibson Creek was named after him. Gibson Creek used to flow down the hill from Kensington Community Centre down the hill, through Kingcrest Park and under King Edward Village at Kingsway and Knight. Gibson Creek met another major local creek, which was known as Davy Creek, and then flowed across Gibby’s Field. The combined creek then flowed down across Clark Park before joining China Creek, which flowed into the east end of False Creek. There are people living in Kensington–Cedar Cottage today who remember Gibby’s Field when the creek used to flow through it, and even remember Moses Gibson! Some residents remember that Gibby’s Field was a magnet for children for miles around in the 1920s, and more recently. Children used to treat Gibby’s Field like a local park. They would gather there to have picnics by the creek, to fish in the creek, and to pick crab apples and hard pears from a nearby orchard. But you had to watch out because some of the boys used to have fruit fights and you had to watch out for Moses Gibson’s dairy cows who used to graze there. Learn more about the history of the Gibby’s Field. A higher resolution version of this photograph. In 2000–2001, a group of local citizens, who called themselves the Gibby’s Field Group, got wind that the City of Vancouver was planning to develop the three City lots. They raised awareness about the historical and ecological value of Gibby’s Field and succeeded in getting a moratorium placed on development of the lots. Learn more about the work of the Gibby’s Field Group. Acknowledge the historical and cultural value of Gibby’s Field. Recognize the urban ecology of Gibby’s Field and its natural features. Turn Gibby’s Field into a viable community green space. Learn more about the work of the Gibby’s Field Subcommittee and photographs of Gibby’s Field events organized by the subcommittee. If interested, you can obtain more information about Gibby’s Field by visiting the Documents and Related Links pages on this website, and contacting the Gibby’s Field Subcommittee.